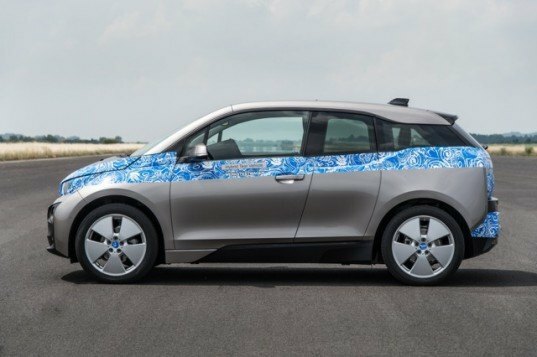 We’re still a week from the official debut of the 2014 i3 electric vehicle, but BMW just announced that the EV will launch at a starting price point of $42,275 before any state or federal tax incentives. The vehicle is set to arrive in U.S. in the second quarter of 2014 with an optional extender that can travel 180 miles on a single charge. The 2014 BMW i3 electric vehicle is powered by a rear mounted 170-hp electric motor and a 22-kWh lithium-ion battery. The standard i3 will have a range up to 100 miles, but an optional two-cylinder range extender engine will increase the i3’s total range to around 180 miles. From a public fast-charging station the new DC Fast Charger will provide an 80 percent charge from a fully depleted battery in just 20 minutes. BMW says that the i3 will be the first mass produced car with a carbon fiber reinforced plastic passenger cell mounted on an aluminum chassis. Also even though the i3 is subcompact designed for city centers, its interior will be about the same size as the larger BMW 3 Series sedan, despite the fact that the i3 is much shorter. 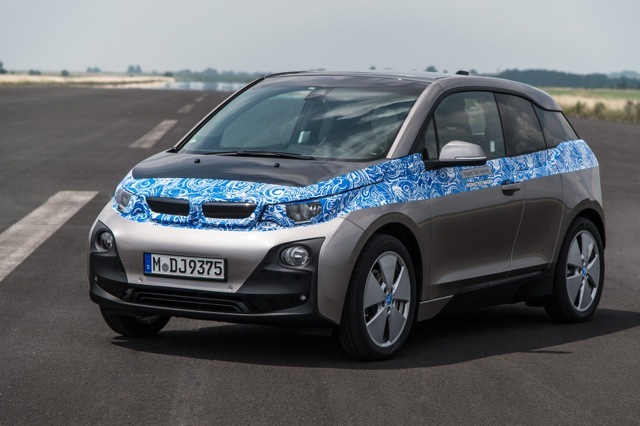 Next week the BMW i3 is going to debut at three simultaneous events in New York, London and Beijing on Monday, July 29. We're still a week from the official debut of the 2014 i3 electric vehicle, but BMW just announced that the EV will launch at a starting price point of $42,275 before any state or federal tax incentives. The vehicle is set to arrive in U.S. in the second quarter of 2014 with an optional extender that can travel 180 miles on a single charge.